Group Photo of Being Student NED Chapter Team who met with Engr. Iqbal Ahmed Khan at his place. From left to right: President of Being Student NED Chapter Fizza Hassan Khan, Malaika Tanweer, Director of Publications, Being Student NED Chapter, Engr. Iqbal Ahmed Khan, Wasiq Khan, Founder Being Student, Asher Ahmed, General Secretary Being Student NED Chapter. Being Student NED Chapter was established with the aim of bridging the gap between theories and practices, students and professionals and institutes and organizations in order to promote economic prosperity and foster the growth of entrepreneurial ecosystems through various campus activities. Our mission is to create a society of learners where all stakeholders of education come together and help each other with their services, solve each other’s problems with their learning and experience and eventually contribute in making a better society. BS NED Chapter is Being Student’s first campus office in any university, solely based on self-revenue generation. File photo of Founder Being Student, Engr. Wasiq Khan during the launching ceremony of Being Student. Being Student is a technology inspired venture and is an initiative to bring about the much-needed transformation in the field of education in Pakistan. We’re a meaningful medium for students, parents and educators to connect with each other, to participate in forums, share the challenges & excitement of learning and teaching, and to be part of a community that leads the transformation of education. Being Student was founded by Engr. 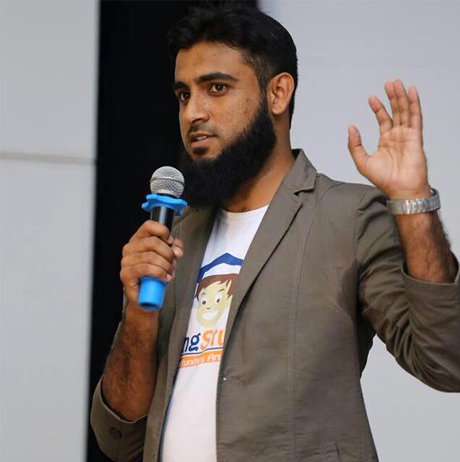 Wasiq Khan, who is a Mechanical Engineering graduate from NED University 2006-07 batch. He is an alumnus and he has been through all the problems that students face during their academics. He was well aware of student life, all the issues they have to face during their projects, internships and after graduations. So Being Student was an initiative taken to help students get past these issues. 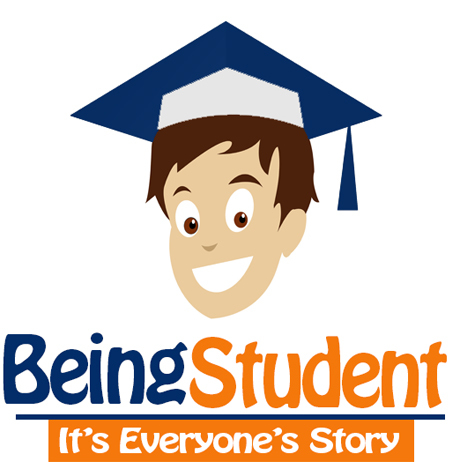 Over the course of three years since 2015 when the company was founded, Being Student has helped more than 2500 students on its own, without getting any funding or financial assistance from government or supporting body. In our quest to explore more opportunities for students, we luckily met with Engr. Iqbal Ahmed Khan, Vice President of Saudi Aramco Ex-Employee Association (SAEEA), in May 2017, who appreciated us in our efforts and gifted us with his valuable words of wisdom. In order to accomplish our mission, we sought out for advice from Engr. 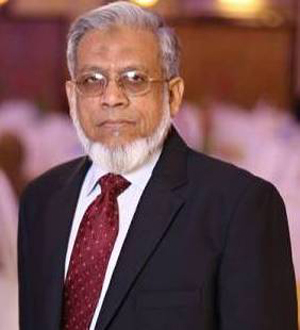 Iqbal A. Khan, He encouraged us to arrange industrial visits as they provide great learning opportunities for the students and even offered his guidance in the matter. With his help Being Student NED Chapter collaborated with SAEEA in the interest of a better future for the students. This collaboration helped us to arrange 2 extremely valuable and learning industrial visits to South Asian Pakistan Terminal (SAPT). Group Photo of Participants of Visit # 1 at SAPT on August 13, 2017. SAPT Powerhouse Building, it has a capacity of 36MW in plan. STS Cranes at SAPT in Parking Position. 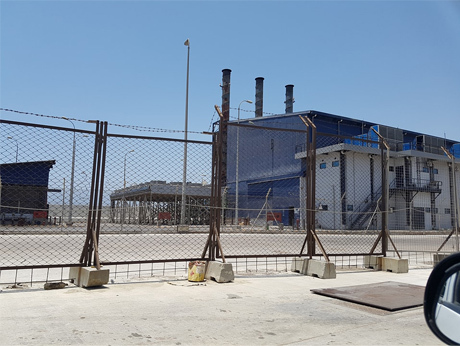 Power Plant: Total power generation is 36 MW by 4 diesel generators that produce 8 MW each & 2 other diesel generators that produce 2 MW each. This power is used to operate all the machines – including the STS cranes that take 1.8 MW maximum power each. STS & RTGCs: There are 8 massive Shore-to-Ship/Ship-To-Shore cranes in the facility which ensure smooth handling of shipment. 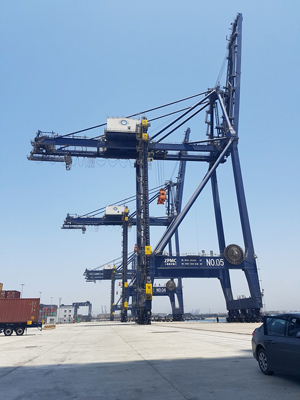 Beside STS cranes, the port also has a total of 52 Rubber Tyred Gantry Cranes (RTGCs) among which 33 are currently in use. These cranes allow for transportation of load anywhere within the 85 Ha of the port. Admin block: The Central Control Facility allows the control of operation of all these machines from one room. 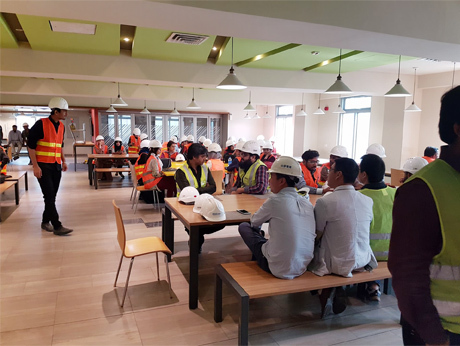 This visit proved to be a fruitful one as it brought students much closer to the industry and they were able to experience the site first-hand. 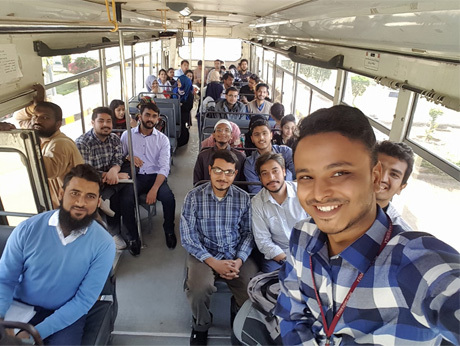 Students in NED University Point while en route to SAPT Visit # 2 on January 20, 2018. Refreshment arrangements were made in the Canteen of SAPT for students of NED University. 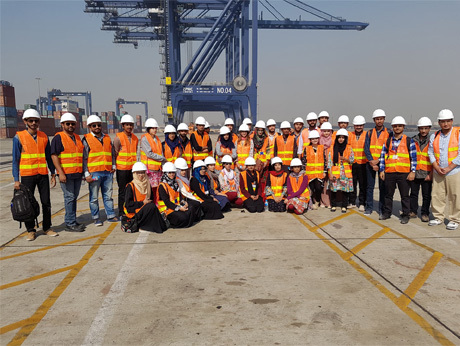 The next industrial visit was conducted on January 20, 2018 and much like the first visit to South Asian Pakistan Terminal we were very excited for this one as well. We departed NED Campus at 09:30 a.m. and reached the site at around half past 10. Once again we were met by the welcoming admin staff of SAPT that included Engr. Mr. Zohaib, Mr. Kazim and Mr. Mujeeb Ahmed Baloch and some very experienced civil engineering staff as well. Refreshments were served and they briefed us about their operations. The intro session took place in the admin block which has the control rooms and also includes a complete model of the terminal. The computerized control rooms are crucial in all their operations as they maximize efficiency which increases productivity. The Ship-to-Shore/Shore-to-Ship cranes that are operated can work up to 10-11 hours and they recently made a world record of handling 2200 containers in a time of an hour which is a tremendous feat. Students being briefed at the Admin Block by Engr. Mujeeb Ahmed Baloch. 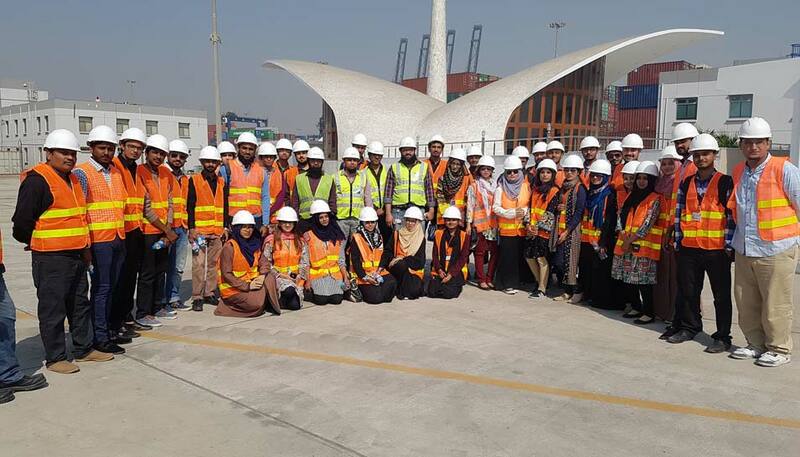 Group Photo of Students at the Terminal to observe port operations. Next, we moved towards the terminal where the students were able to witness all the operations being carried out. They also witnessed the docking of a ship at SAPT, which was a once-in-a-lifetime experience for them. 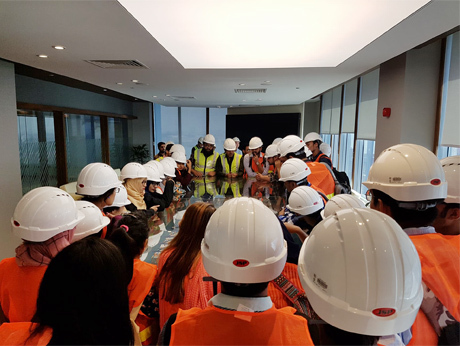 The experienced civil engineers were able to brief future civil engineers about the construction and structures of the terminal, and also explained the used of modern techniques they deployed to make the perfect foundations. 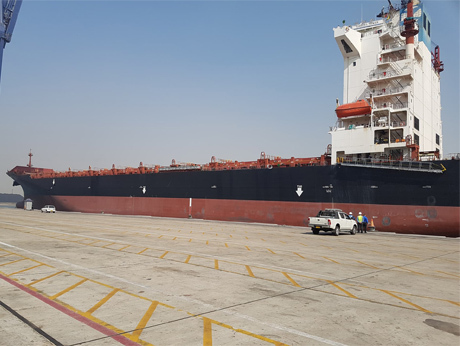 The draft of SAPT is 16 meters and has a turning radius of 1- KM, enough to cater mother vessels, along with 2 berths which are operated by 8 STS cranes in phase-1. Also, the key wall separating the terminal and water is 60 meters in depth and has fenders as shock absorbers. 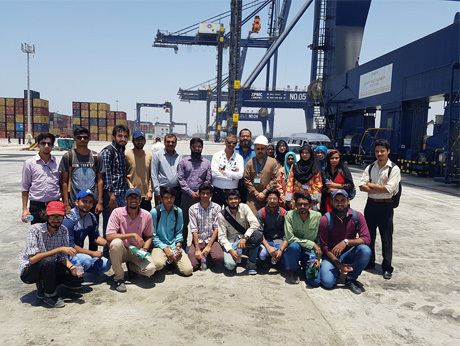 For the first time in life, students witnessed docking of a cargo ship at a port. 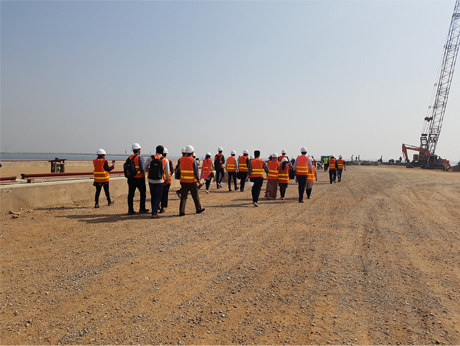 Students visiting the site of Phase 2 of SAPT, which currently is in ground testing and improvement phase. Since our last visit phase -2 work has been initiated and ground testing and water breaking activities are in progress. SAPT is also equipped with 2 engineering workshops; one for STS cranes, while the other is for other machinery. The terminal also hosts Shaheen Mosque, a breath-taking mosque which was inaugurated by General Zia Ul Haq, which can be seen far and wide from the sea. Group of students and SAPT officials posing in front of Shaheen Mosque SAPT. We are extremely thankful to SAPT and especially SAEEA members for these incredible learning opportunities and we look forward to more opportunities that would bridge the gap between students and the industry. As a student support organization, we seek guidance, programs, support and assistance of any kind that will help us in achieving our goals. We have some research projects on our own, team members on payroll and on part-time jobs and we are looking forward to building a permanent space for our organization with state of the art quality equipment and operational support so that we may fulfill the requirements of many students, because, for us, responsibility comes first than sales and profits. Department of Publications, Being Student NED Chapter.